Want to deter intruders or vandals without spending a lot of money on a security system? Then SVAT's imitation security cameras are the solution for you. 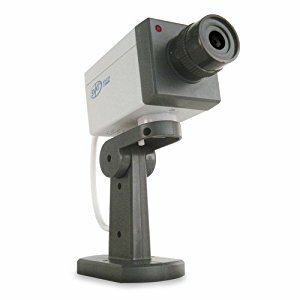 The ISC100 is an imitation camera that looks like a real security camera. With the same external components as a functioning security camera, the ISC100 is a cost effective crime prevention investment. This motion activated imitation security camera swivels side to side when it detects motion and imitates the actual panning of a security camera and the wire adds reality. The activation LED light will flash making the camera look as if it is in operation. Neighbours and visitors will think that you have a complete video surveillance system. This unit can be easily ceiling or wall mounted and aimed with its adjustable bracket. Help prevent or deter suspicious activity by placing the security camera in a noticeable place. The ISC100 can also heighten the effectiveness of an existing security system at a low cost. This camera decoy will make people think twice about stealing or doing damage to your property. Have fun watching how customers react when they think they are being video taped. This camera looks and functions like the real thing giving you no need to spend excessive money on expensive cameras. This is a great visual deterrent for shoplifting, theft and vandalism. Perfect for any domestic or commercial use such as an office, retail space, business or home. Imitation cameras have demonstrated success in many types of home and businesses such as motels, retail stores, museums, apartments restaurants, automobile lots and many others. Having no control over the use of any product once in the buyer's possession, we assume no liability associated with the use of fake security cameras. Under no circumstances is SVAT responsible for any loss, cost, damage or injury, of any kind arising out of the use of the foregoing product.